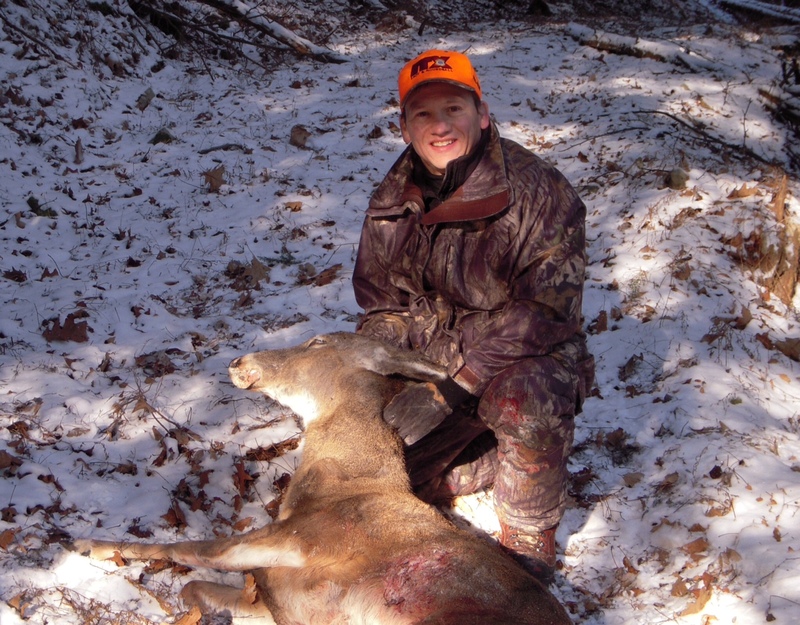 I recently got back from a muzzleloader whitetail deer hunt in our hometown in Pennsylvania. This is my favorite deer hunt and one that I’ve been doing nearly every year for the past 30 years. I really got in to it when I was in college because the season starts the day after Christmas during the semester break. Since then, I’ve managed to schedule vacation for this hunt during the holiday week or in early January each year. The picture below shows the TC Hawken 50 cal flintlock I received as a high-school graduation gift from my parents. 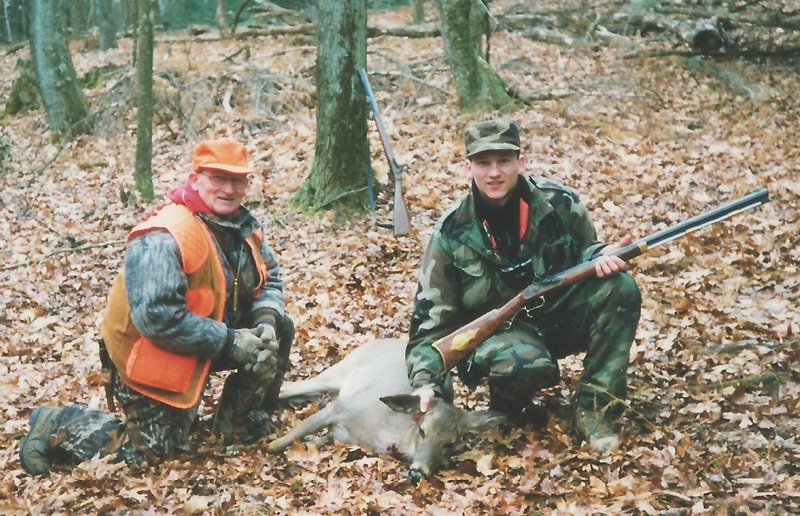 I’ve taken many deer with it, including the one shown here with my dad during a successful hunt in the late-1990s. Many states have a muzzleloader season but this one restricts the rifle to flintlock ignition and with open sites. Since most hunters hunt the earlier rifle and archery seasons it’s a great time to hunt deer without pressure from other hunters. 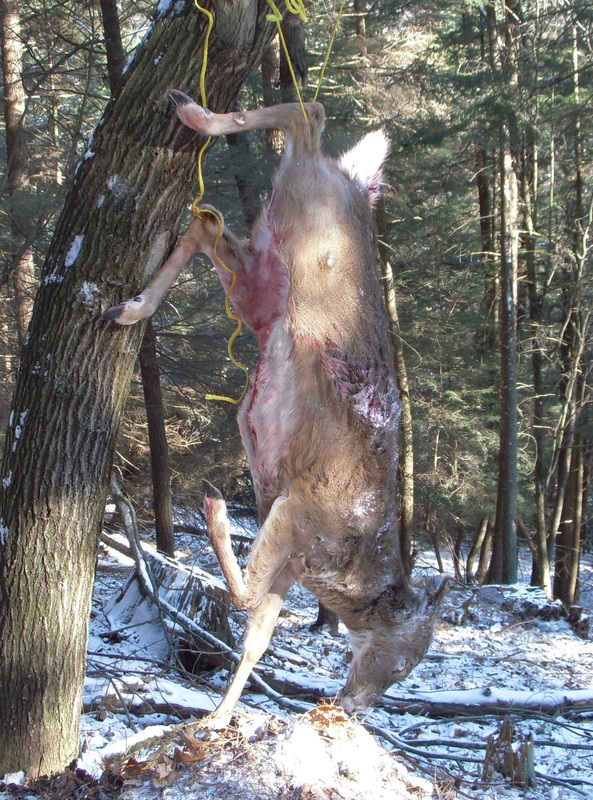 Also, for this season an un-punched buck tag can be used for a doe so it’s great way to get venison for the year. 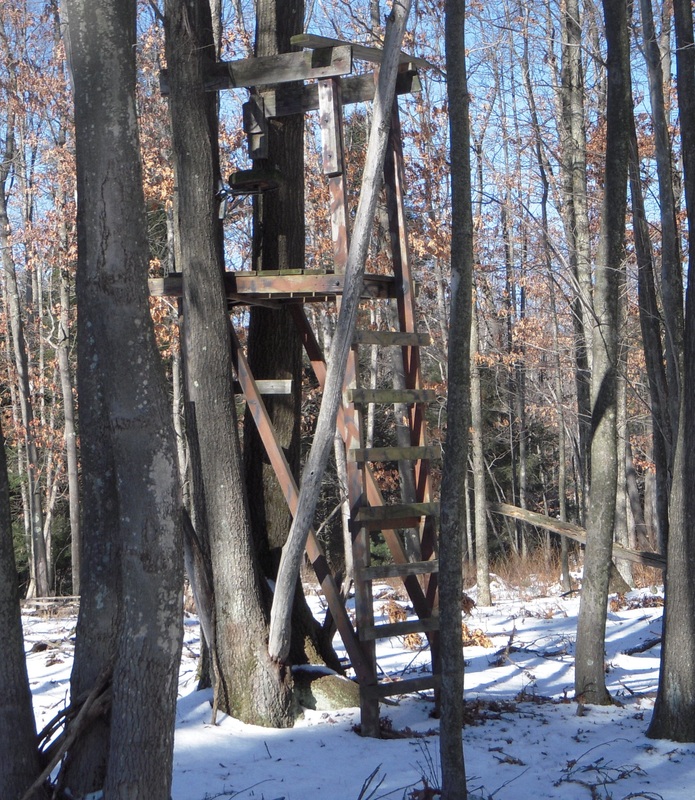 I’ve been lucky to have permission to hunt on family property there where there are several tree stands built on typical deer travel routes like the one shown below. I prefer to hunt from the ground, stalking or tracking the deer, but when the deer are moving a stand works well. Hunting with a flintlock is a lot like archery hunting; you have to get close to the deer and ideally be stationary as the deer comes in to range. About 4 inches of snow fell the night before my first afternoon hunt and along with the snow came frigid temperatures, around 10 deg F. After 30 minutes in the stand I saw three deer sneaking through the woods at the edge of a clearing roughly 200 yards away. Since I use a traditional cloth patch and round ball in my flintlock I like the deer to be within 90 yards before I feel comfortable taking a shot. So I waited to see if they would work their way closer. Almost an hour later, just before sunset, a group of deer came within 60 yards downhill of my stand but were working through a group of hemlock trees. I watched them for a few minutes and waited for one to step into an opening. Using the dead rest of the stand I lined up on a doe that gave me a good broadside shot and squeezed the trigger. There was a good spark from the flint, the flashpan powder went off and the powder in the barrel ignited all within a fraction of a second to send the round-ball on its way. Through the blackpowder smoke I could see the group of deer scattering in all directions and all of them heading downhill. I went and checked for any blood or hair in the spot where the deer was standing but didn’t find any –Dang! – did I miss? 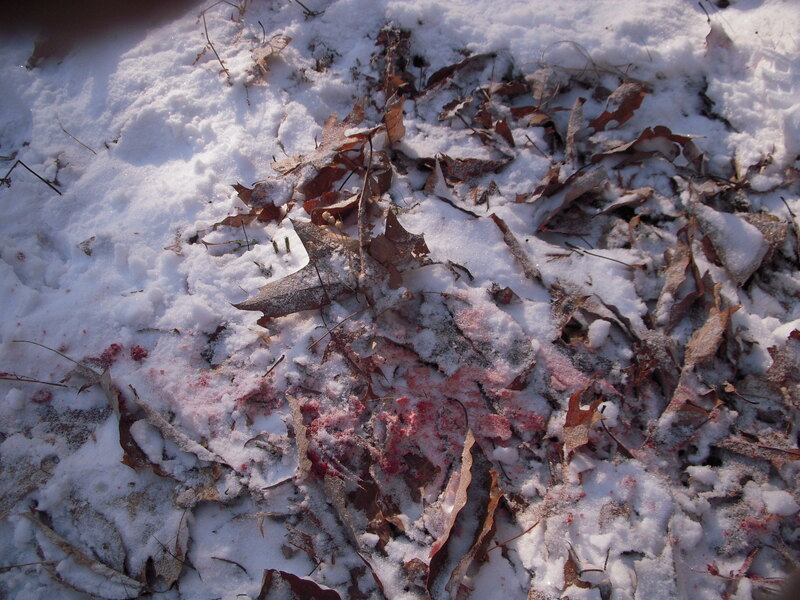 I followed the tracks in the snow and eventually found a good spot of blood where the deer stumbled heading downhill. It was getting dark and I couldn’t get a good line on the blood trail and there were tons of deer tracks in the area so I decided to wait until morning to pick up the track. My brother Mick who knows every inch of the property agreed to help me track it in the morning. Of course he got there earlier than I did and he found the deer, dead on an old logging path most of the way down the hill. I hit the deer a little further back in the chest cavity than I would have liked, but it was enough for it to go down and stay down. Going after it in the morning was a good idea, this way the deer wasn’t pressured to run any further and it was plenty cold enough that the meat wouldn’t spoil. In fact, with the overnight temperature near zero, it was nearly frozen solid. Now the tough part, figuring out how to get the deer out of the steep hollow. It was a bigger than average, older whitetail doe and it wouldn’t be easy to drag out of there, even with snow on the ground. So I decided to skin and quarter it there. Instead of doing the work on the ground, Mick helped me hoist it in a nearby tree so I could get to work on it. He had to leave the property then so I took care of it from there. It was so cold that while I worked on the skinning and quartering my water bottle kept freezing up on me, but I eventually got the job done. This is somewhat unusual to have to pack out a deer there. Typically a deer can be dragged out to a nearby road, especially on the snow, or a cart can be used to move it to a truck or to camp. 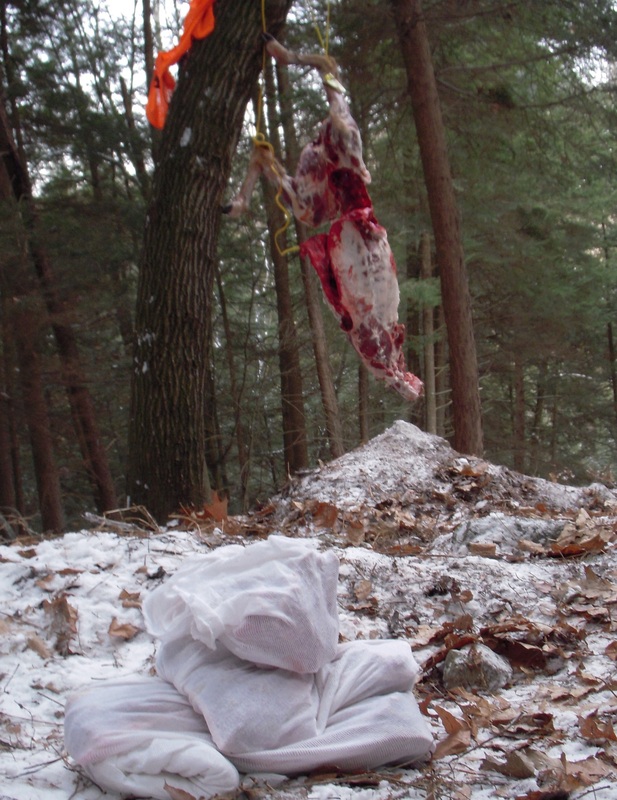 For my western hunting friends, packing out an animal is part of a normal hunt, but not for central PA.
Luckily I had my game bags with me to store the meat and make it easier to pack out. I was able to get all of the meat out in two trips and did final clean-up of the quarters back at camp. The quarters were hung in the camp refrigerators to age until my return to California the following week. 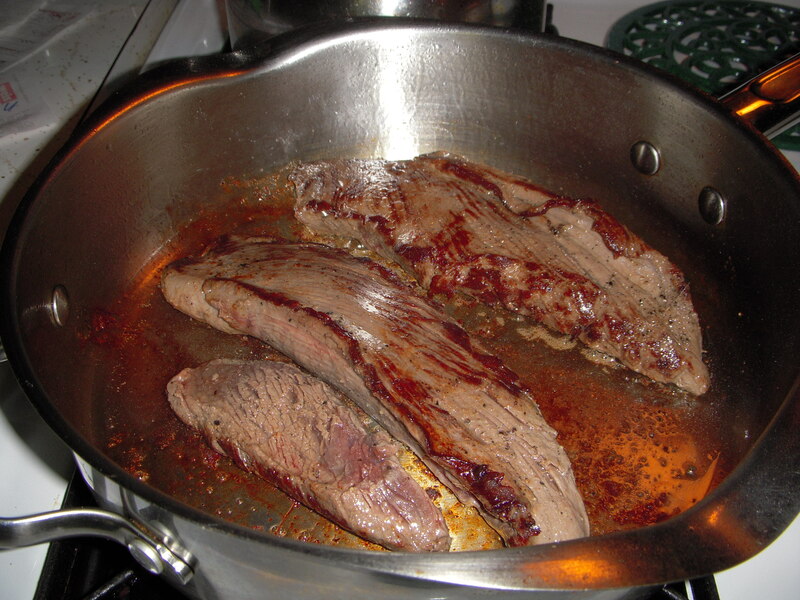 A few nights later I cooked up the tenderloins and a small piece of the backstrap that mistakenly got sliced off while my cold hands were boning out the meat….. I marinated the meat for 2 days in a simple marinade of salt, pepper, onion powder, garlic powder and some olive oil. All it took was a simple sear on the stove top and 8 minutes to finish in the oven and it was a great “first cut” meal. 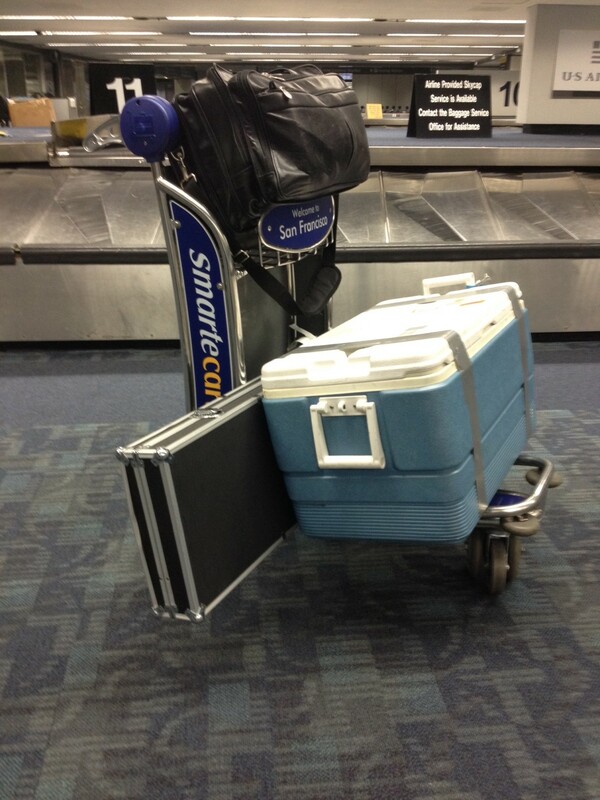 The rest of the meat made it back to California where I did the final butchering a few days later.